[ Dr. Burney's Royal Academy at Gosport. ] Autograph Letter Signed by an eleven-year-old 'George T Medd', regarding arrangements for the 'Vacation'. 'Royal Academy | Gosport June 1st. 1848'. 2pp., 4to. Bifolium. On aged and worn paper. The text of the letter is on both sides of the first leaf; the second leaf, around half of which has been torn away, carries four postmarks, and the remains of Medd's autograph address to his father John Medd, Stockport, Cheshire. The letter reads: 'My dear Papa | I am happy to inform you that our Vacation will commence the 15th Instant when I trust that Dr. Burney and the Revd. E. Burney will be enabled to give you a satisfactory report of my conduct and improverment during the half term. [ Lord Eldon; a lunatic ] Autograph Signature ('Eldon') to Chancery document re. 'the Matter of Bulkeley Gould a Lunatic' and his sister Fanny Whalley, regarding the question of the administration of his estate in Bovingdon, Herts, and elsewhere. [ London, High Court of Chancery. ] 19 June 1826. 4pp., folio. Bifolium. In fair condition, on aged and worn paper. Small slip of paper, with note in Victorian hand, attached to head of first leaf. The subject of the document, Bulkeley Gould, had in the 1770s left the Army for a career in the East India Company, being declared insane in 1788. His sister Frances 'Fanny' Gould - in later years a woman of fashion - married first Lieut.-Gen. Charles Horneck (1759-1804) and then Rev. Thomas Sedgewick Whalley (1746-1828). Boswell was a friend of their father Lieut. Col.
[ Brandenbourg House Masquerade, 1794. ] Engraved ticket of admission, with illustration by Bartolozzi from E. F. Burney and crested seal in red wax. Brandenburg [Brandenbourg] House, Fulham. [1794 or 1800?]. A scarce and unusual item. On one side of a piece of 11 x 15 cm paper. Laid down on 13 x 17 cm paper backing. Aged and creased, with three evenly-spaced vertical folds. The illustration, at the centre of the ticket, is captioned 'MISCUIT UTILE DULCI', and depicts two naked cherubs, one with a Mercury helmet, playing with books and lyre. Beneath, in small letters, 'E. F. Burney del.' and 'F. Bartolozzi sculps.' To the right of the engraving is a crested seal in red wax. Above the engraving: 'BRANDENBOURG HOUSE MASQUERADE | Monday the 24th. of February at Eleven o'Clock'. [Samuel Prout, watercolour artist.] Fragment of Autograph Letter, with references to 'Dr. Tournay' and 'my friend 'Dr Burney', and to the house of the recipient being 'the rendezvous of all the learned & the rich in Oxford'. 4 Brixton Place, Brixton, Surrey. 12 January 1833. On both sides of a rectangular (5.5 x 16.5 cm) strip cut from letter. In fair condition, with light signs of age and wear. Recto: '4 Brixton place | Brixton Surry [sic] | Janry: 12th. 1833 | Sir | M Mackenzie has conveyed to me y polite offier of allowing a few prospectus of my [...]'. Verso: 'to Dr. Tournay by my friend Dr Burney, but as your house is the rendezvous of all the learned & the rich in Oxford, perhaps it is unnecessary for me to solicit the onor of Dr Tournay's influence. | I remain, | [...]'. [Printed Prospectus] The Diary and Letters of Madame d'Arblay ... Edited by her Niece. Four pages, 8vo, stabholes, edges grubby, mainly good. It advertises the contents of the first three volumes, Royal and Noble personages who appear, literary characters,followed by "Opinions of the Press" forming the main bulk of the Prospectus. Elegant ink drawings of fashionable young ladies, said to be unused illustrations by Edward Burney for his cousin Fanny Burney's 'Evelina'. 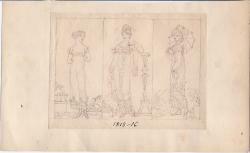 The first page of three drawings, young women posed separately,is dated in a contemporary hand '1815-16' and the other page, with four interacting figures is dated '1816-17'. In good condition, on lightly-aged paper. Dimensions are approximate. 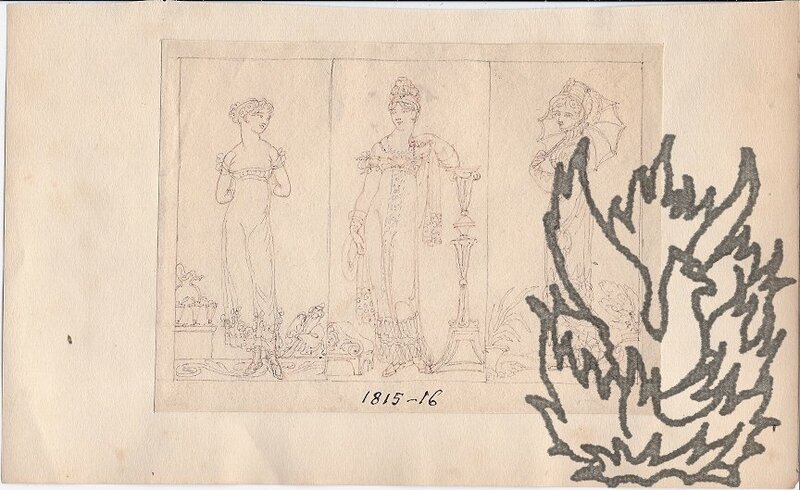 The three illustrations (1815-6), each 8.5 x 4 cm, form three panels on a 10 x 13.5 cm piece of paper. Autograph Letter Signed to 'Mr Wilson'. 18 November 1931; London Library, St. James's Square, S.W.1. 1 page, 8vo. Grubby but in good condition. 'In case you have not already seen it, I beg to enclose you a leaflet relating to my new book. | I shall be grateful for any help that you can give it.' Signed 'G. E. Manwaring'. The book was 'My Friend the Admiral. The life, letters, and journals of Rear-Admiral James Burney' (Routledge, 1931).